If I judged my favorite holster as the one that I’ve worn the most, it would have to be the Yaqui Slide. This little rig is the epitome of simplicity and meets all of the requirements that I have for a defensive holster. Forty to fifty years ago, Col. Jeff Cooper did a lot of work in Mexico and South America. Most of it was teaching, some of it was consulting, and a certain portion of it was none of our business. However, on one of his jaunts to El Salvador, Cooper made the acquaintance of a fellow named Eduardo Chahin. Now, I don’t know, exactly, what their connection was and it could have fallen under the “none of our business” portion of Cooper’s resume. Regardless of the reason for their meeting, Cooper came away with a nifty little holster for his 1911. It was, essentially, a holster with no bottom to it. Cooper took the project to Milt Sparks, who was building holsters in Idaho, and the pair tweaked the design and called it the Yaqui Slide. The Yaqui Slide, as presented by Cooper & Sparks, is an example of simplicity and efficiency. Sparks used only the best holster leather in crafting the rig. The holster body has a thick leather welt on its back edge to help hold the pistol securely. It has a slight forward cant to the holster as an aid in drawing and to prevent the pistol from being snatched from behind. And there is also a slot cut in the belt loop portion that allows the holster to be positioned over a belt loop on the pants to keep the rig from moving around. I can’t remember when I got my first Yaqui Slide from Sparks, but it must have been in the mid-1970’s. Later, I ordered a right & left-hand pair of the holsters in brown basketweave. All of my Yaqui Slides have been for the 1911 pistol. Over the years, I’ve never had a problem with the Yaqui Slide. It has always held my pistol securely enough that a safety strap was not necessary. However, portly fellows might have a little trouble wearing one if they sit in an arm chair. If you fill up the seat, the gun muzzle might just engage the arm of the chair, unholstering your pistol and dumping it on the floor. Unfortunately, Milt Sparks Holsters is no longer making the Yaqui Slide. They discontinued the rig right after Mr. Sparks passed away. The good news is that Dave Cox, owner of Davis Leather Company, is making an exact copy of the Yaqui. In fact, the one that I am wearing in the above photo is from Dave’s shop. The Yaqui Slide is a piece of 1911 history and a darned good defensive holster. Link to Davis Leather doesn’t seem to work. We got that fixed for you! Question: If you sit in a car, won’t the contact with the seat push the pistol outward and upward? Or is the Yaqui so tight it won’t? I PURCHASED ONE OF THESE HOLSTERS & THE MATCHING DOUBLE MAG POUCH FROM “GALCO” IN THE EARLY 1990’S. CARRIED THIS SETUP ON A BLACK “WILDERNESS INSTRUCTORS” HEAVY STITCHED NYLON BELT—-PERFECT FOR JEANS OR BDU TROUSERS. After finding this article, I immediately call Dave Cox and ordered two: one black and one saddle tan. I have been searching for a traditional Yaqui slide holster for years. I too have used the Galco holster and have got good service from their version. Dave told me 6 weeks in May. Still waiting. I know he does fine work: I have a AA walk-n-draw he made. An excellent, well made holster. I use mine daily! I’ve used a Yaqui slide with a Glock 33 that I’ve been more than happy with. It’s a very good design. Davis Leather Link does not work? I have 2 of Andy’s Yaqui slide holsters and I absolutely love them. They are very secure and actually quite fast from concealment draw. They look exactly like the picture and are heavy duty. 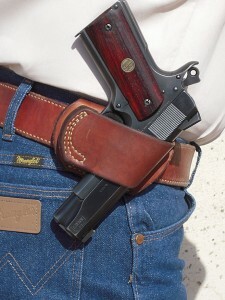 I keep one on my belt at all times and no one has ever asked if it was a holster. Do they make this Yaqui slide to fit a Walther PPS and if so where can I get one ?